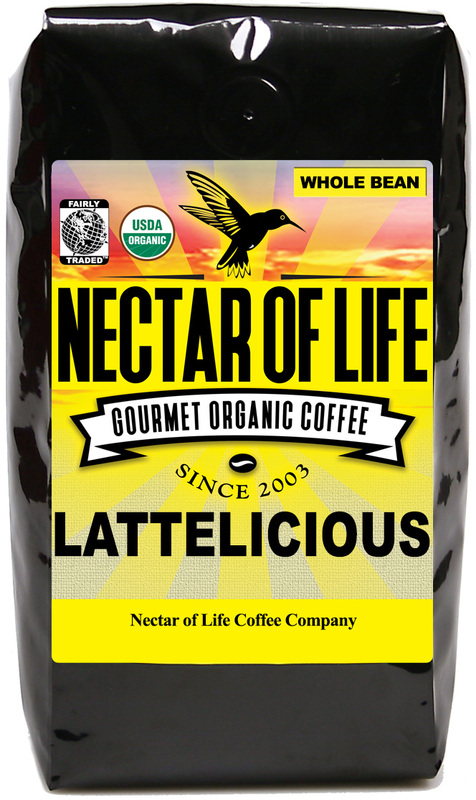 Lattelicious - Organic Fair Trade Espresso Coffee Blend. Roaster's Notes: Nutty chocolate flavors that become rich when mixed with cream. We created this blend specially for the latte lover. This blend is comprised of Strictly Hard Bean (SHB) and Hard Bean (HB) gourmet Fair Trade, organic Arabica coffees from Central and South America. In addition to the American coffees we add some more exotic coffees (think Indonesia.) This coffee may be prepared as espresso, French Press, or drip coffee. It highly benefits from being mixed with milk. When mixed with milk this blend produces a rich, robust nectar with hints of smoky chocolate. Delicious! I love this blend. It's incredibly smooth. I do an espresso grind on it and make my morning lattes. I also make bullet proof coffee with it. By far my go to blend. A perfectly satisfying brew, without bitterness or acidity. I've been enjoying Nectar of Life Coffee for years now. Once I tasted LATTELICIOUS, it's been all I drink, with few exceptions. It makes the MOST DELICIOUS latte! I'm always pleased to offer my company this fine coffee.. Nectar of Life also maintains the highest quality and standards for its products and customer service. Thank you Nectar of Life! Full of flavor, with a hint of bitterness that is smoothed out by milk or cream. The beans are uniformly dark (French or Italian?) roasted, with oily surface. Very tasty! I have tried all ORGANIC coffee and yours is the best! You have become our VERY favorite coffee!!! I purchased some before Christmas and shared with some friends...and they love it too. It is wonderful to have such a superb organic coffee without the organic price. I found your website while looking for local (Northwest) organic coffee retailers. Your website was the most fascinating, thanks for all the great information.